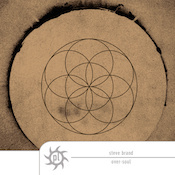 Using a nine-minute track from a 2011 release as a starting point, Steve Brand expands on the idea beautifully with the three long pieces that form Over-Soul. This is a very big bit of work, a broad and cosmically panoramic thing that also manages to be as personal and spiritual as an epiphany. As Brand gently layers long pads over, through, or alongside each other and kneads their surfaces with texture, the listener cannot help but ease into a very quiet space. There’s a slight rite of passage to go through first, however, as the opening track, “The Wise Silence,” sets about balancing shadow and light over its 21-minute run. Brand brings us in with a dark, rising tone that turns to a growling breath rich in low-end tones. It’s reasonably ominous, which makes the shift toward lighter sounds that much more potent. The shift comes and goes as the piece goes on, pulling the listener deeper into the flow. It’s remarkable what Brand achieves with what feels like a fairly slight sound-set. The layers here are not overly deep, but they’re fully effective–you feel the weight of the shadows around you, and you feel the relief of shifting away from them. “The Collective Heart” moves into a realm that is equal parts spacemusic and pure ambient, where the windy hiss of washes and high pads arrive to regulate your breathing. Brand does an expert job of handling the transition between these tracks. The calm that “The Collective Heart” eventually gives us doesn’t come immediately; it unfolds slowly from out of the darker landscape of its predecessor. There’s a nice minimal feel at play here, a cool sparseness of movement that brings its own power. Brand plays a bit with dissonance here, but lightly so, underscoring stretches with what sounds like the modified sound of a temple bowl. The ringing sound draws the attention just slightly toward it as it comes and goes. With “Unity” we are moved into a meditative space, soft and largely free of shadow. The tone here is higher overall, and hopeful, bring the proceedings to a cleansing close. Over-Soul truly is a release that you need to make time to simply dive into. It will pull you into itself, as I said, regardless of how much attention you think you’re giving it. But this music draws out something intensely personal. It touches the listener very deeply. It is quite stirring while managing to be deceptively simple in structure. Brand’s music always carries a very honest, human feel. It’s in tune with you just as much as you are with it. While it’s his music, in listening it becomes very much yours. Set aside the time and pay close attention to the lush emotional content of Over-Soul.